Joseph and Sam revisit their childhood on Tauron; Zoe and Tamara begin cleaning up New Cap City; Agent Jordan is called on the carpet regarding his STO investigation. Read the synopsis of this episode at TVRage. "Dirteaters" is a pejorative term in the Colonies used to describe those of Tauron origin. 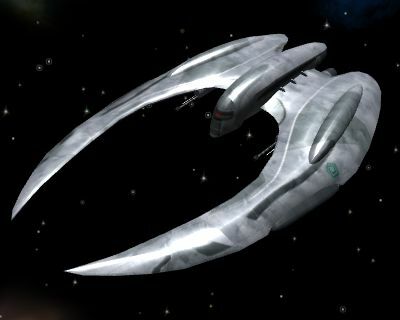 The elder William Adama (Joseph and Sam's father) refers to a family heirloom that is a Tauron ceremonial element as a skivvy malanos. Though the Tauron language on the show is usually made up of ancient and modern Greek, I've been unable to find a translation of these words. He also refers to a vial of poison capsules as kapi; this same vial of kapi makes a dramatic return in "Apotheosis". This episode reveals that Joseph and Sam's mother was named Isabelle. Zoe and Tamara take on their Avenging Angels personas, to clean the scum out of New Cap City, at a violent dive called Sinny McNutt's Slash & Cut Den of Iniquity. Possibly, the place was named for Caprica's cinematographer, Stephen McNutt. At 9:01 on the DVD, notice that Olaf is carving his name in the bar top at Sinny McNutt's. Cans of Lethe beer are seen on a bar table at Sinny's. This brand has been seen in previous episodes. Olaf is upset at losing his avatar in New Cap City because he'd been working on it for five years. This tells us the game is at least that old. While researching Tauron at 13:20 on the DVD, Daniel is eating what appears to be Chinese take-out food, complete with chopsticks! I wonder which colony stands in for China on the show? Daniel learns that the Ha'la'tha owns a company called Obolus Inc. Since the Ha'la'tha is Tauron, and since the Tauron language is made up largely of words from ancient Greek, we can find that "obolus" is a silver coin from ancient Greece. So, the company is essentially named "Money Inc."
Recent acquisitions of Obolus Inc. are NexTelecom, Edincords, Tecustar, Serveti, and Tampony. A couple of these are the names of companies in the real world, but not major ones. During the newscast at 15:04 on the DVD, one of the advertising posters behind the two girls wearing Avenging Angels t-shirts is for an event in Vancouver, where the series was filmed. Notice that the restaurant at 21:11 on the DVD has received an "A" grade from the designated Caprican government inspection agency. Also at 21:11 on the DVD, a Smart Car is parked in front of the restaurant. 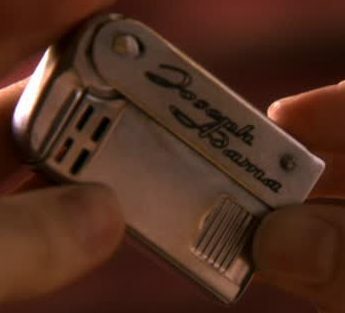 In this episode, we get our first look at Joseph's cigarette lighter which later appears in the BSG2000 episode "The Hand of God". Daniel discovered that Zoe was still alive in v-world by seeing an Avenging Angels t-shirt with her face on it in the "real world". If she and Tamara had continued their Avenging Angels crusade, Joseph would have inevitably learned about his daughter's continued existence in there as well; and, really, who's to say he still wouldn't? After Agent Duram is placed on suspension from the GDD, Agent Youngblood takes charge of all his cases. She is the agent he worked with in earlier episodes on the maglev bombing investigation.